Andrew Henshall has been involved in golf at all levels at his beloved club Wilmslow since he joined as a junior member in 1970 and with the Cheshire Union of Golf Clubs since joining the board in 2013. 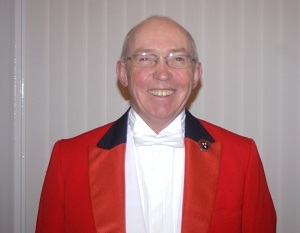 He is now very delighted and honoured personally as well as for his club to have been chosen to be the CUGC President for 2019 and he hopes that 2019 is going to be a great year for the CUGC and with the Centenary of the County coming up in 2020, there is a lot to look forward to in Cheshire. Andrew said: “I view the role of President as someone who should go out and communicate with all the clubs in the County and try to get a feel for what they want from CUGC, as well as explaining what we can do for them. This is probably mission impossible as there are over 95 clubs in Cheshire and if I spent one day at each club, I’d fill my year at the helm entirely as I already have 106 days accounted for with CUGC events, meetings, matches and tournaments, and I still want to play golf whenever I can. However, I will try and get out and about throughout the County. “The things I am really looking forward to in 2019 are all the Big Six events, (where the 6 northern counties plus a team from the Isle of Man compete for the opportunity to play in the national finals) for the Men, Boys and Seniors, and after finishing second in all three levels last year, it would be great to see the County progress to the National Finals in one, two or all three of these in my year as President. Then there is the Walker Cup which takes place at Royal Liverpool in Cheshire during my year in office, and all the County Matches at all levels and the many County Tournaments that CUGC run which I hope will be well supported by golfers from across the County again this year. “My earliest golfing memories are of caddying for my Dad as a junior and of his playing partners inviting me to join their four ball if they were one short, I learnt a lot about the etiquette and manners expected of a young man in those days, especially if you wanted to play golf at such a wonderful place as The Wilmslow Golf Club. “Dad was a much better golfer than me, and even though he didn’t take up the game until he was 40, he got down to 5 handicap within 5 years and also served on the board at CUGC as well as Captaining both Wilmslow and Alderley Edge Golf Clubs. “Whilst I have played golf all over the UK including some of the best courses there are, Wilmslow still remains one of my favourite places to play golf, as the course provides a fair challenge at all times. “Having served on the committee at Wilmslow for over 10 years in a variety of roles, including 8 of those as Junior Organiser, I joined the CUGC Board 6 years ago, and have been delighted to be able to work with the Under 16s team, initiating the team matches at this level and I am now lucky enough to enjoy seeing some of the boys who have played for the Under 16s team progress through to the Boy’s team and also into the Men’s team. “I believe CUGC has done a lot of good for the clubs in Cheshire and will do even more over the next few years as we actively go out to the clubs to spread the word of what we can do to help them. “My predecessor as president, Chris Moore has set about rewriting the articles of association for the County to bring them up to date and he has also outlined proposals for reducing the size of the board to make it a more manageable structure. Whilst not everyone agrees with what he has proposed it will make for some lively debate this year as we look to ensure the board can fulfil the role of growing the game throughout Cheshire, as well as laying on competitions, matches and tournaments for the best players in the county. “If I have one aim during my year it is to try and get all clubs to have a junior section. So many clubs seem to think it is of no benefit to them, but if a club can encourage junior boys and girls to start playing and become members of their clubs, there is always the chance that their parents may have played golf in the past and will see it as a way to engage with their children in an activity that is both competitive as well as sociable. Andrew hopes that 2019 is going to be a great year for the CUGC and with the Centenary of the County coming up in 2020, there is a lot to look forward to in Cheshire.